Open Tuesday - Saturday, 11am - 6pm. 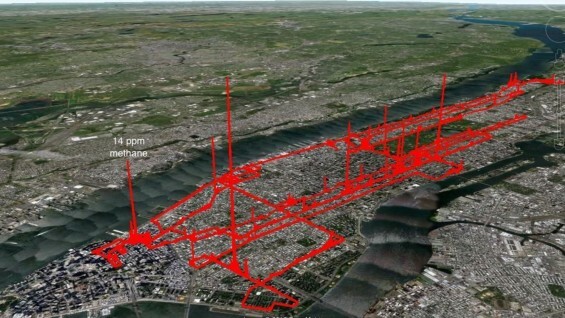 Is Manhattan sitting in a cloud of methane? Odorless, invisible, lighter-than-air methane is a significant urban pollutant that is a potential crisis in the making. Developed by artists Ruth Hardinger and Rebecca Smith as a confluence of climate change research, environmental activism and artistic practice, EMISSIONS: Images from the Mixing Layer initiates new ways of sourcing information, sharing and expressing data. The project draws upon a scientific study conducted by Gas Safety Inc. under the aegis of Damascus Citizens for Sustainability which utilized highly sensitive technology to measure fugitive methane emissions over 160 miles of roadway in Manhattan. This study reveals the island lies under a cloud of methane originating primarily from aging natural gas pipelines - some laid in the 19th century. Since methane is 20 times more potent a greenhouse gas than carbon dioxide, and natural gas is over 90% raw methane, the study challenges the notion that natural gas is part of the solution to climate change. In fact, it suggests that methane leakage, throughout its life cycle, makes natural gas a greater contributor to climate change than other fossil fuels. Colleen Fitzgibbon, Ruth Hardinger, Joe Lewis, Christy Rupp, Rebecca Smith. Link to Manhattan methane emissions study. EMISSIONS: Images from the Mixing Layer is a two-part program consisting of a panel discussion moderated by Al Appleton and an art exhibition curated by Ruth Hardinger and Rebecca Smith. It is sponsored by the Institute for Sustainable Design at Cooper Union for Marfa Dialogues/NY in cooperation with The Rauschenberg Foundation.